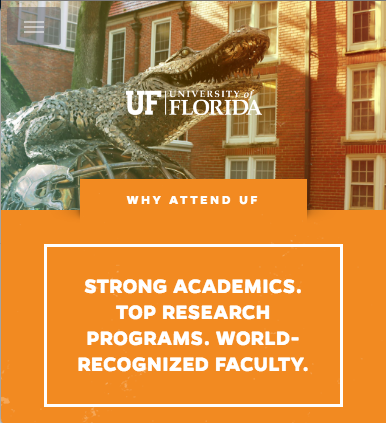 The Fourth Annual SESPECS Research-to-Practice Symposium will focus on bringing together all of our Special Education, School Psychology, and Early Childhood Studies graduate students with faculty from within and outside of UF’s College of Education in a professional conference-like environment. Dr. Michael Coyne will serve as our keynote speaker highlighting his work in vocabulary development within an MTSS framework. Following our keynote presentation, refreshments will be served and students will display their own research work during a poster session. We cordially invite all UF College of Education faculty and students to attend this event. The Center for Gender, Sexualities, and Women’s Studies Research invites you to a timely screening of the documentary “Anita: Speaking Truth to Power,” followed by a discussion about abuse of power and sexual harassment. Dean Laura Rosenbury, Center affiliate and Levin, Mabie & Levin Professor of Law at the UF Levin College of Law, will be introducing the documentary with opening remarks about the significance of Dr. Anita Hill’s testimony and the Judge Clarence Thomas confirmation hearings. In the wake of the recent testimony by Dr. Christine Blasey Ford at the Judge Kavanaugh hearings, revisiting “Anita” is an opportunity to explore similarities and differences in these two landmark moments. Following the documentary, Dr. Zully Rivera-Ramos and Dr. Natasha Maynard-Pemba from the UF Counseling and Wellness Center will facilitate a discussion. There will be popcorn, sandwiches, and beverages available during the film. Join us to reflect together on the power of women’s voices, race, sexual harassment, and power in law and government. This Film screening is a part of the #HearMeToo Series at the UF Center for Gender, Sexualities, and Women’s Studies Research, marking the UN’s International Day for the Elimination of Violence Against Women and the beginning of 16 days of activism against gender-based violence. This event is free and open to the public. For questions, contact Dr. Maddy Coy at m.coy@ufl.edu. 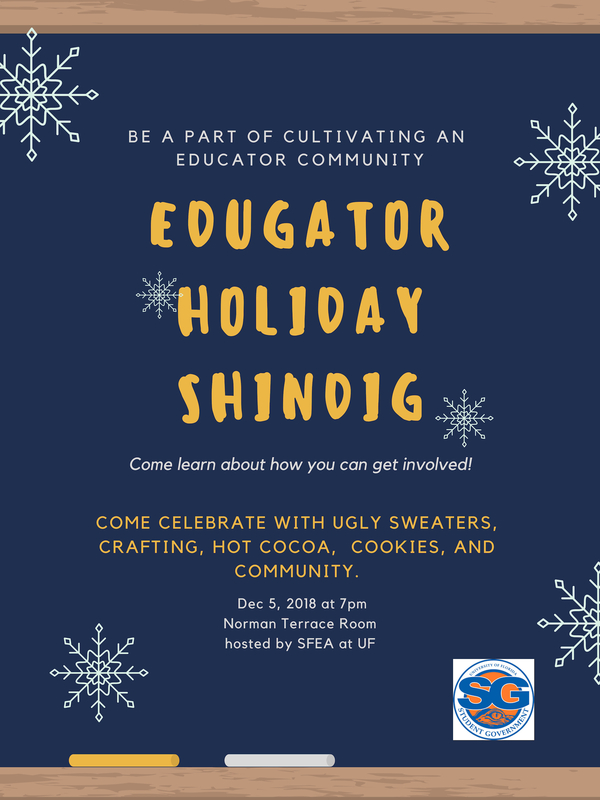 The Student Florida Education Association (SFEA) at UF is starting back up this coming spring! To kick it off we will be hosting a holiday party. There is going to be hot cocoa, cookies, and crafting. We will also be talking about how to get involved in SFEA. Please join us on Wednesday, December 5 at 7pm in the Norman Terrace Room. Invitation attached. Congratulations to the College of Education students who received International Student Achievement Awards at the University of Florida International Center (UFIC) ceremony on November 14th. Those recognized: Huzeyfe Cakmakci, Feifei Fan, Debolina Ghosh, Mark Preston Lopez, and Sherry Zhou. Additionally, special recognition to Mark Preston Lopez who was selected as a university award winner for the Alec Courtelis Award. You have until Saturday, December 1st to purchase a Global EduGator T-Shirt. Please go to the online store to make your selection, http://printingiscool.limitedrun.com/. Early Childhood, Elementary & Special Ed Students who will be doing their FULL-TIME INTERNSHIP in Fall 2019 must attend Thursday, December 6, Norman Hall Terrace Room – 9:30am ALL STUDENTS. If you have any questions, please contact Jennifer Wrighton, me know. Also, if you would like to make a monetary donation, please contact Jennifer or stop by 2-083A Norman. We will do your shopping for you or you can make a check payable to “Toys for Tots”. Thanks in advance for your contribution. The American Educational Research Association (AERA) is pleased to announce the AERA Undergraduate Student Education Research Training Workshop. The workshop, led by junior and senior scholars, will give fellows an overview of how education research is designed across fields, how quantitative and qualitative research methods are used in studies, and how research is applied to education policy and practice. All application materials must be submitted by 11:59pm (PST) on Thursday, January 10, 2019. Please direct questions to George Wimberly, Director of Professional Development at 202-238-3200 or fellowships@aera.net. The Administration for Children and Families (ACF) has long supported rigorous dissertation research of policy relevance by advanced doctoral students. We are excited to announce that the Office of Planning, Research & Evaluation (OPRE) has forecasted and is considering funding Child Care, Head Start, Family Strengthening, and Behavioral Interventions graduate student dissertation grants in 2019. Please visit grants.gov for the Child Care, Head Start, Family Strengthening, and Behavioral Interventions Scholars forecasts to view the estimated application due dates, subscribe to email notifications regarding these grant opportunities, and for links to other information. We also encourage regular visits to ACF’s grants home page for the latest published Funding Opportunity Announcements. Are you interested in becoming an academic, non-profit, or federal agency researcher? Our graduate students are focused on cutting edge topics that will make them competitive across a range of prevention science opportunities. See attachment for details. Assistantships are available, and the deadline for applications is January 15. 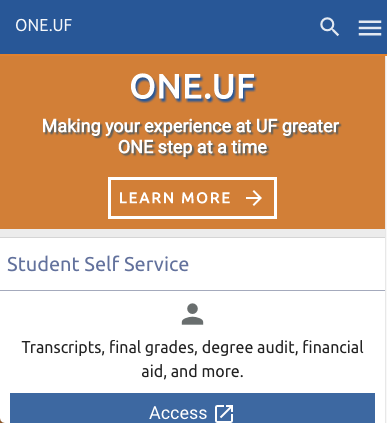 For questions, please contact Coordinator of Academic Programs, Gregg Henderschiedt, at ghenderschiedt@ufl.edu or Graduate Coordinator, David Diehl at dcdiehl@ufl.edu. Anthony Elementary School is hiring a motivated, energetic, and innovative fifth grade teacher. We serve approximately 450 students in grades Pre-Kindergarten through 5th grade with a teaching staff of 30. We are known as the “Little Red Schoolhouse” and we are part of the northern schools in Marion County School District showcasing our “Northside Pride”. We are looking for teachers that match our culture – “Every Student, Every Day, Whatever It Takes”. Marion County Public Schools serves 43,000 students in Central Florida with more than 6,000 employees. The district features 52 traditional public schools plus four charter schools. Competitive salaries include paid health insurance, paid time off, and other perks. The district is headquartered in Ocala, Florida just 30 miles south of Gainesville and 75 miles northwest of Orlando. If you are interested in making a difference in children’s lives, please contact Mr. Martin, Dean of Students at James.Martin@marion.k12.fl.us, phone: 352-671-6000. The Advising Specialist is responsible for providing direction, information, personal attention, care and support to students in the development and planning of their educational pursuits at Santa Fe College (SF). For complete details and application, click here. Lincoln High School has a job opening for a Math position, to begin in January. The posting can be found at https://pats.leon.k12.fl.us/. Lincoln is a great school and we have a 2-year new teacher program to help our new staff acclimate to teaching. If you have any questions, please contact Assistant Principal Jason Koerner at Koernerj2@leonschools.net. Interested in Tutoring? Join the Strategy Program! Our program at the Hawkins Center is looking for graduate students interested in working with at-risk college students and student-athletes with disabilities. Tutoring day and night part time tutors. This position gives excellent experience working with at risk students in athletics. If you have anyone that is interested please feel free to have them reach out to me personally or fill out the application. I have attached our flyer and included the application link below. Thank you for your time and help!is looking for Graduate Students and Professionals who are interested in working with at-risk college students and student-athletes with disabilities. See attachment for further details. June 3 – July 26: Highly selective, eight-week, competitively paid internship. ALL MAJORS ENCOURAGED TO APPLY! JOIN OUR TEAM AND MAKE AN IMPACT THIS SUMMER! Berkeley Preparatory School seeks passionate, optimistic, and tenacious college students to serve as our Berkeley Academy teachers this summer! The Berkeley Academy helps highly motivated, low-income students in our Tampa Bay community reach their unique potential and achieve their dream of going to college. The Institute of Higher Education is looking for a graduate research assistant who can conduct data collection and policy analysis related to state financing of colleges and universities. The graduate research assistant (GRA) will operate within a multi-university team of policy researchers. Primary responsibilities include data collection and coding, collaborating with team members, reporting progress and results. Regular tasks will require GRA to interpret policy-related documents and state budget documents. The role requires contextual knowledge (minimum) of public finance and budgets as well as clear and concise communication skills. The GRA will collect data in Word and Excel and report information to team members, including other GRAs and faculty team members. Other administrative and research-oriented duties incidental to the work tasks may be assigned. If interested please apply at https://jobs.ufl.edu/ and reference requisition 509251. The Institute of Higher Education is looking for a graduate research assistant to engage campus-based practitioners as part of a guided student pathways study. 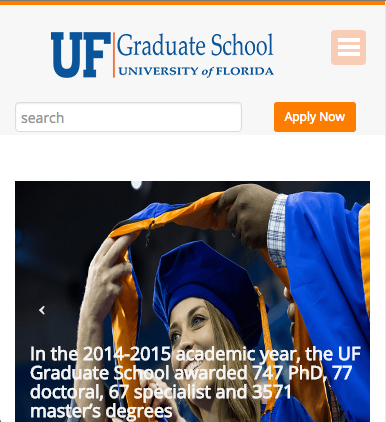 The graduate research assistant (GRA) will collaborate with the UF-based research team to provide evidence-based recommendations regarding best practices when using guided pathways as academic plans at four-year universities. The GRA will interview higher education practitioners to identify best practices and conduct basic research tasks, such as annotated bibliographies and literature reviews. The role requires previous research experience as well as clear and concise communication skills. The GRA will collect and disseminate information from partner institutions and generate reports in Word and Excel to document findings. Other administrative and research-oriented duties incidental to the work tasks may be assigned. Minimum Requirements: Bachelor’s degree; Demonstrated ability to conduct basic research tasks and engage in clear and concise communication with stakeholders. If interested please apply at jobs.ufl.edu and reference requisition 509228. Our team partners with PreK-12 low-income schools across NYC to deliver high-quality academic summer learning programs. Our Teaching Fellows receive 40 hours of intensive training and are provided with support for an entire month to prepare an enriching experience for the children we serve. In the last three years, we’ve hired well over 200 college Sophomores, Juniors, Seniors and Graduate students to teach in our schools. The Cade Museum for Creativity & Invention is now accepting applications for winter break volunteers. Volunteers will assist with Cade Museum winter break camps on December 26-28 and January 2-4. Camps will focus on film as well as art and STEM. If you are interested, please email Michele Kuhn, Volunteer Coordinator, at volunteercrd@cademuseum.org for more information. If you enjoy STEAM and would like more experience working with children, this opportunity is for you! Seeking a volunteer tutor for first grade grandson in all academic areas. Please contact Gloria Davis at 352-378-4302 or 352-871-4068. 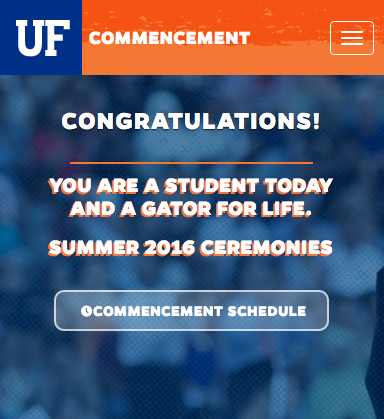 UF faculty member is seeking after school care for children from 4 PM to 6 PM each weekday. Paying $17/hour. If interested, please contact crcogle@me.com. Our son is funny and goofy and and working on learning how to be an adult. We would like the applicant to be willing to help him with this journey. Work will include picking him up from his day program at 3:30 and then working with him until we come home at 5:30. We want someone who will guide him through daily living skill (but NOT DO these things for him). Also someone who will have fun with him and treat him like he is a young adult. Our son loves to be out in the community, he loves music and movies, and being goofy. Looking for a tutor that has the educational skills and patience to tutor my 14 yr. old 9th grade daughter in the subjects of Math & Science. My daughter has been diagnosed with ADHD she is very smart but gets bored/loses focus very easily. Looking for someone who may be able to introduce her to new strategies that will help her obtain the knowledge she being taught as well as effective studying habits. Tutoring needed Mondays and Wednesdays, Mondays and Thursdays, or Tuesdays & Thursdays for one hour during the times 6:00-8:00 (whichever time slot/days that works best for you). I can also be flexible with the days. We can discuss a neutral location to meet. If interested and for further details please email me wordkl@ufl.edu. Starting in January babysitter needed for 2 boys ages 14 & 12, Monday-Friday from 7:15 to 8:50 and M, T, TR and F afternoons 3:00-5:30 (sometimes 4:30). Hired sitter will take boys to their respective schools. Schools near each other. Good driving record a must. Rate: $10.00 HR. Other sitting opportunities may occur as current sitters schedules change. Email: michelesstone@gmail.com. Looking to offer a room (furnished or otherwise) in my home in exchange for part-time childcare help for my two boys ages 7 and 5. I am a single mother with shared custody, so there would be approximately 3 days a week when the children are not in the home (Monday morning until Thursday after school). Responsibilities would mirror that of an Au Pair: childcare help, especially on weekends, supervision and assistance with homework, chores, and home projects (like gardening or creative building). Light household chores would be required, but mostly to set an example and model habits of participation and organization to the children. They are capable of their age-appropriate chores and are encouraged at all times to participate in every aspect of respecting and caring for our home ie. straightening up, taking out trash/compost/recycling, loading and unloading dishwasher, setting the table, learning to cook/bake/sew, collecting/sorting/and putting away laundry, cleaning their own rooms/messes, watering plants, basic yard work, etc. We enjoy an active lifestyle with limited screen time and a focus on diverse cultural and educational opportunities. We have a piano and craft room, which you would have access to. Artistic and musical activities are greatly encouraged, as are dance, performance arts, and martial arts. My main goal is having regular one-on-one time with each individual child, some nighttime babysitting, as well as the option to bring them on occasional weekend work trips and winter ski trips (all travel expenses would be covered). You will have a private room, wi-fi, and full access to the shared rooms in the home. Requirements: Good communication skills, a positive vibe, tidy habits, previous experience working with children, safe driving record, good references, non-smoker, and reliable vehicle. A native or fluent speaker of either German or Spanish preferred (this is a multilingual home). Please contact Geraecka at geraecka.lyonns@gmail.com with references/resume, personal expectations, and what you are excited to contribute as a new member of our family.